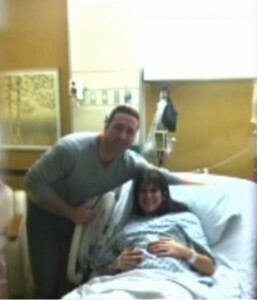 Katie Balogh was looking forward to the new phase in her life when she found out she was expecting. But three months into her pregnancy and the 29 year old found out that she had cervical cancer and the choice to either terminate her pregnancy or wait till the baby was born as the cancer spread. Cevical cancer affects 10,000 women annually and for nearly 4,000 it is fatal. Till recently there was no viable treatment available for this form of cancer which mostly is detected in aging women, who are past their child bearing years. But in Katie’s case, the diagnosis came at a time when she was about to become a mom for the first time. Three months into her pregnancy Katie’s routine pap smear test results came abnormal. More tests followed. “It did come back as cancerous. And at that point we were given some choices,” Katie says choking back tears. The couple was given the choice of either to terminate the pregnancy and begin cancer treatment or wait till the baby was born while the cancer continued to spread. But the doctors gave another option. “Continuing with the pregnancy, and having surgery done to remove part of the cervix to have a stitch put in to hold the uterus in,” Katie says. Gynecological Oncologist Steven Waggoner knew that the surgery was possible and was not uncommon in women. But it was extremely rare for pregnant women. He still gave the option to Katie. “Traditionally we’ve removed the entire uterus with the cervix but recent studies have shown that by doing a more limited operation and preserving the uterus can give very good outcomes,” Dr. Waggoner says. The couple agreed to go ahead with the surgery. “It really was just kind of a shot in the dark but I knew that he would do everything in his power to save my baby and cure me,” Katie remembers. In her fourth month, Katie went for the operation at University Hospitals fully aware of the odds and the extreme complication of the process. “Once we were on the table if I were to start hemorrhaging we would lose the baby and have to have a hysterectomy,” Katie says. But Dr. Waggoner was determined to save both mom and baby. “This surgery, also necessitated placement of a special stitch or a support into the uterus to replace what the cervix normally does,” Dr. Waggoner says. While the surgery was a success Katie had to still wait to ensure that the stitch was holding. “I think it wasn’t until 26 weeks or 27 weeks that we were finally able to embrace the pregnancy as something that is happening and we’re gonna have this baby and she’s gonna be fine,” Katie recalls. 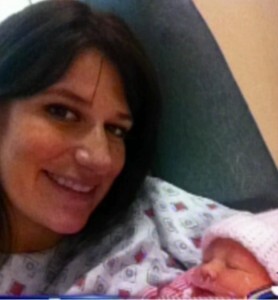 Finally Baby Samantha was born in December via C-section just a few weeks early and perfectly healthy. What is more incredible is that Katie’s cancer is gone and she can become a mother again in the future.